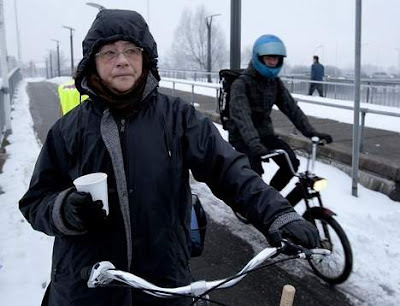 Cyclists crossing the bicycle bridge over the harbour in Randers were rewarded with hot cocoa last week. Randers is a provincial town in Jutland with about 60,000 citizens. The city's traffic department and the European Union programme Trendy Travel and Beredskabstjenesten [anyone have a good translation for THAT?] set up a table and offered winter cyclists a hot drink of chocolate goodness in the morning as a pat on the back for cycling in this year's harsh winter. Not everyone fancied stopping - cycling is A to B business in Denmark and when you leave A you generally just want to get to B - but a number of people took up the offer of cocoa. Like Ilse Andreasen, above. 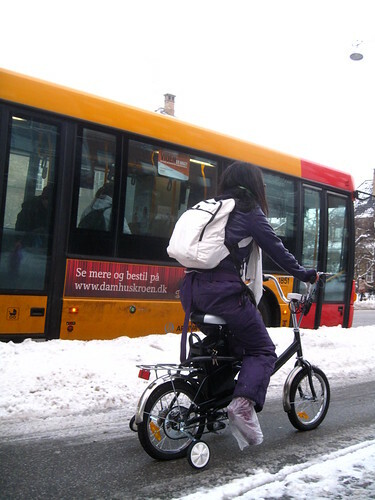 She rides her bicycle to work all year round, except for about five days when it's too slippery. 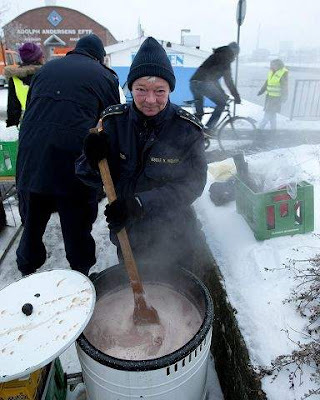 She said to Randers Amts newspaper that it has to be exceptionally cold before she freezes. Good on you, Ilse. The free cocoa is the first of a series of initiatives scheduled for the spring that will place focus on the benefits of cycling to work. Here's the warm cocoa ready for the cyclists. Spoil your Citizen Cyclists wherever possible. That's what we say. 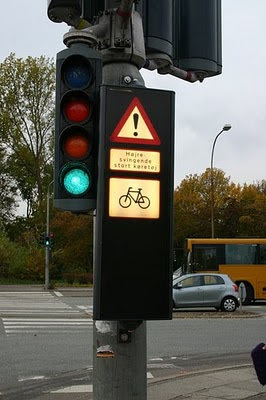 This has nothing to do with bicycles or Citizen Cyclists, but it's hilarious. I think it helps if you know the work of the director Lars von Trier - Mr Miserable. Great satire from The Onion. Thanks to Todd for the link. If there were a World Championship for Promoting Cycling Positively, the Hungarians would be the bookmakers favourites to win every time. There's simply very little competition out there to compete with them. 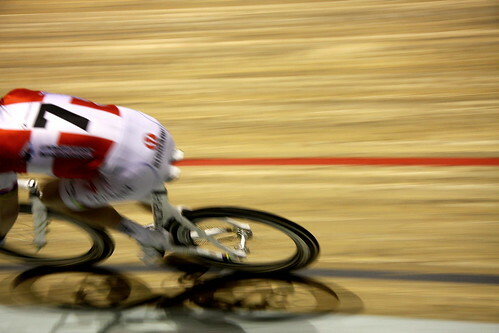 The Dutch would be the only real competitors. Even so the Hungarians would probably win by a spoke simply because they're working towards increasing urban cycling and estabishing a bicycle culture and that energy would put them over the line first. 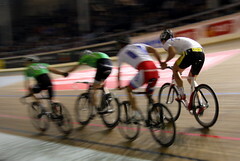 The Hungarian Cyclists Federation - Magyar Kerékpárosklub - are legends at promoting cycling positively. I've had the pleasure to meet with them and discuss promotion and behavioural campaigns. They are extremely well-informed and passionate and just sitting around a table with them is infectious. Their focus is, rightly, on mainstreaming urban cycling. 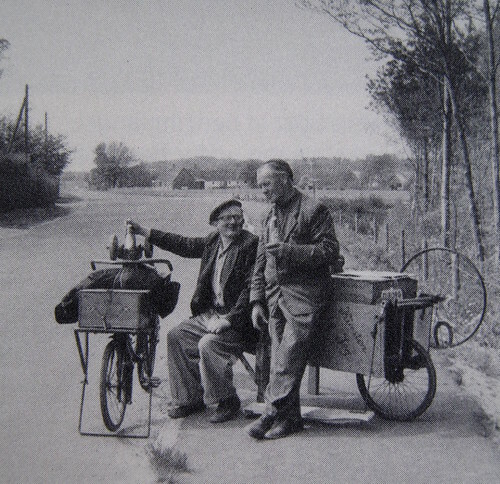 Reestablishing the bicycle as a respected transport option. Respecting the sub-cultural aspects but aiming high at getting regular citizens to ride. 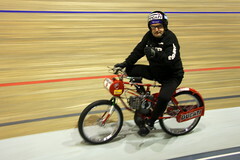 For more about that there's always the Behavourial Challenges for Urban Cycling essay. Here's another film from the campaign. We have enough Hungarian readers on this blog to be able to muster a translation, don't we? Chuck 'em into the comments. Rest assured, there are other cities doing the right thing and investing in campaigns that portray urban cycling for what it is; quick, effortless, enjoyable, etc. We have a few of them in this post about How Other Cities are Promoting Cycling. 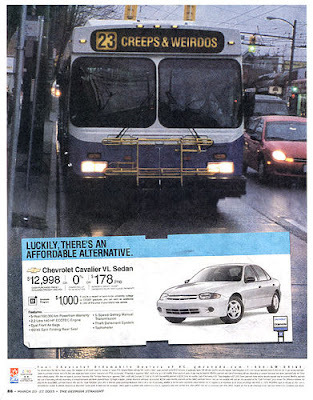 But then there are cities who haven't understood the marketing basics. Like the last film in the above post about other cities, or the laughable attempt at 'promoting' cycling from Los Angeles DoT. 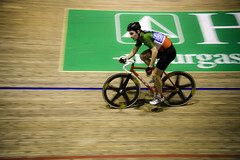 If we're talking World Championships, with the prize being a sharp rise in the number of Citizen Cyclists, cities that promote cycling with fear myths and car-centric angles won't even finish the race while cities like Budapest et al will win all the amazing societal benefits to be won. 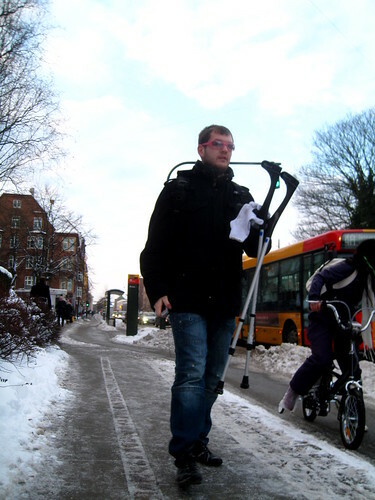 I've been toying with the idea of a series of Copenhagenize Heroes photos. 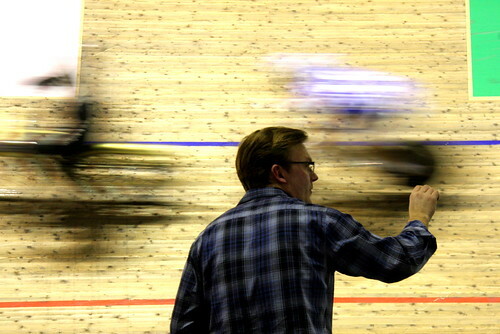 Portraits of people I've been lucky enough to meet on my bicycle travels and who inspire me and Copenhagenize. Let's start tout suite. 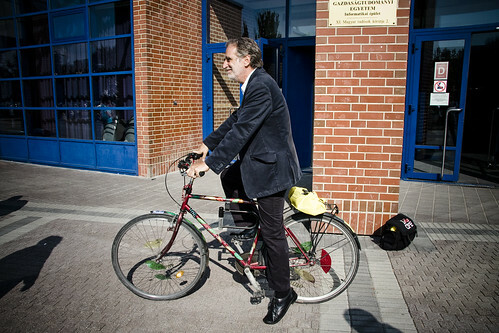 Copenhagenize Hero #1 - Janos Laszlo, President of the Hungarian Cyclists Club. For his undying optimism, passion and visionary goals for putting the bike back into Hungary, under the bottoms of Citizen Cyclists across the land. 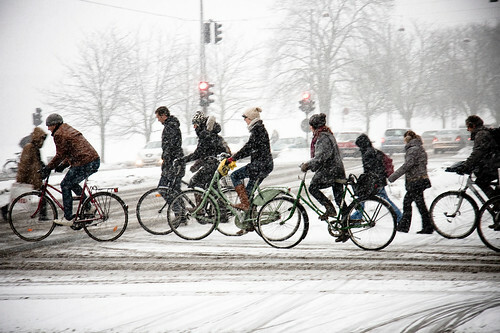 Last year the City of Aarhus - Denmark's second largest city - launched a comprehensive campaign to encourage more citizens to cycle. 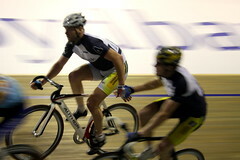 The city's post code is 8000 and the campaign is subsequently called "8000 Advantages to Cycling". Here's some of the highlights of the campaign. Aarhus lags behind Copenhagen and Odense in the levels of cycle traffic so this campaign is aimed at doing something about it. 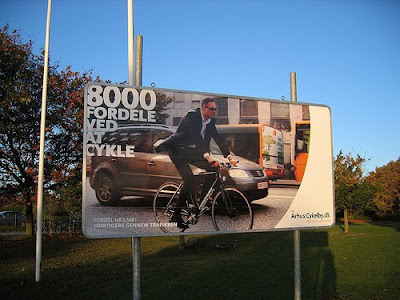 By and large, from a marketing perspective, the campaign does well to sell urban cycling as positive. There are snippets of fear mongering present in the form of bike helmet promotion, despite the warnings of doing so, but it's impressive in the current Culture of Fear climate in Denmark that the campaign is largely positive. Photo from the campaign. 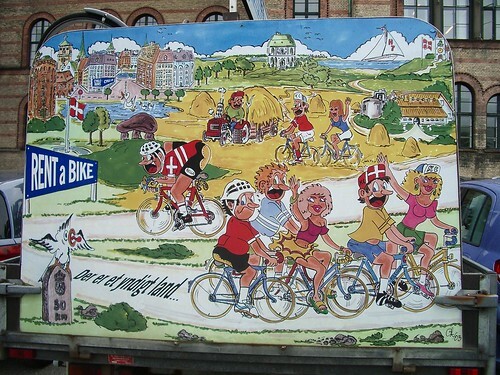 The eternally iconic Cycling Girl so dear to Danish culture. 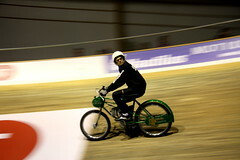 There were also various programmes as a part of the campaign to bring the joy of cycling to children. 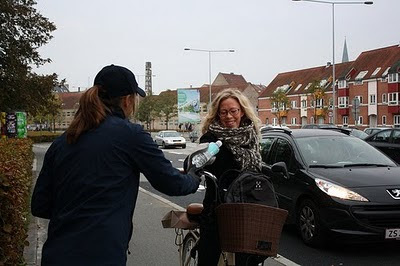 The city sent people out onto the streets and bike lanes to hand out bottles of water and seat covers as encougagement for choosing the bicycle. They whipped together a little youtube film, asking the people they stopped why they choose to ride their bikes. The first girl: "It's healthy and it's fast." 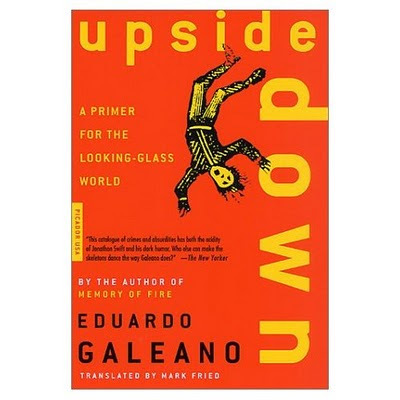 The next chap: "I hate public transport and waiting for buses. And it's healthy, but I don't think about that very much. And it's free!" The little girl in the plastic hat: "Because I like to ride my bicycle." Bless her cotton socks. And when asked if she rides to daycare, she replies yes. Next guy: "It's easy and fast. It's not far to school and regarding grocery shopping, it's just the easiest". Next girl: (I think she says...) "Save money." A number of facilities were implemented along with the campaign. Posters, websites and banners can't do the job alone. Citizens need to see practical, physical additions on the urban landscape. Here we have a long row of new bike racks outside, I believe, a school. On this stretch leading to the school one of the car lanes was removed to create a safe and wide bike lane for the kids. And this sign flashes when a truck turning right is present. A little too much ignoring the bull, in Copenhagenize's opinion - that is to say, if it stands on it's own and without any responsibility placed on the vehicle and driver of the vehicle. 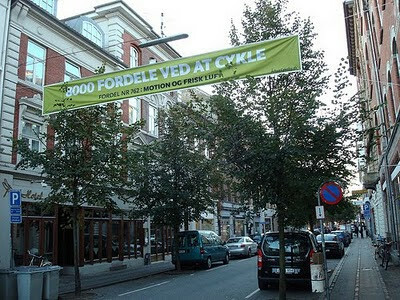 Another visible inititative is the possibility for citizens in Aarhus to let the city know about potholes or other irritating problems regarding cycling. The city will prioritize repairing the problems that citizens send in. 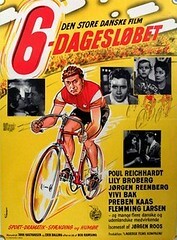 Banners were set up throughout the city highlighting various advantages to choosing the bicycle. Here we have advantage 262: Exercise and Fresh Air. Advantage 7522: Freedom and wind in the hair. 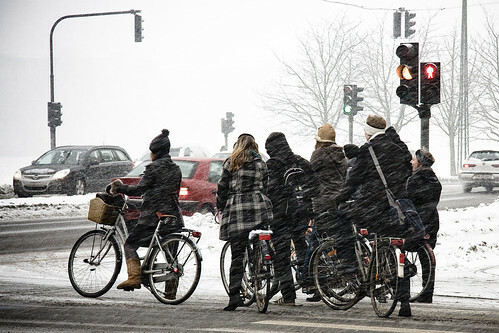 Cycling is hot and with the recent injection of federal money into cycling - 94 billion kroner - many Danish cities are eager to build even more infrastructure and launch campaigns. 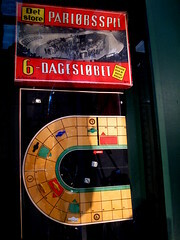 This example from Aarhus leads the way. 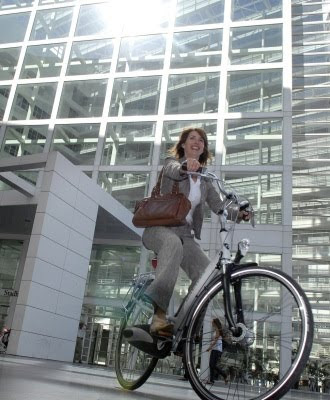 PRESTO – “Promoting Cycling for Everyone as a Daily Transport Mode” is a new project of the EU’s Intelligent Energy – Europe Programme granted by the Executive Agency for Competitiveness and Innovation (EACI). PRESTO is about competence building in cycling policies. 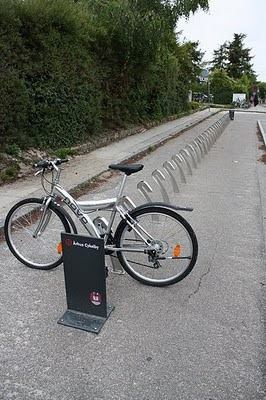 The project aims to offer a set of tools for technicians to create cycle friendly urban environments, to implement sound cycling plans and to start up targeted promotion campaigns. Bremen (Germany): 650 km of bike-lanes inside of streets, incl. stripes and advisory lanes, and the highest rate of bike-transport in cities over half a million inhabitants of Germany. More than 42.000 bike-trips a day are made into the city centre and one third of the trips in Bremen are longer than 6 km. This is remarkable, because the average bike distance in Germany is about 3 km and 85% of the trips are no longer than 6 km. Grenoble (France): 300km of reserved cycle paths in the agglomeration and three outlets rent “Métro-vélo” bicycles to the public. The Métro contributes to improving the safety of “soft modes” by encouraging communes to create 30km/h zones to slow car traffic. As well as, Tczew (Poland), Venice (Italy) and Zagreb (Croatia). From our friends at Curtiba Cycle Chic we have found poetry and bicycles. 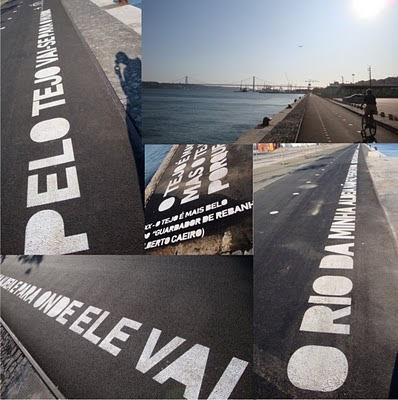 On the bike lane along the banks of the River Tagus in Lisbon excerpts of the poem "The Keeper of Sheep" by Fernando Pessoa (nom de plume: Alberto Caeiro) are printed on the asphalt. What a brilliant idea. Urban cycling may be transport, but it is also culture and marrying it to poetry further removes it from sport, which is the way forward for encouraging more people to cycle. I like the graphic addition to the urban landscape, too. Perfect for The Slow Bicycle Movement. 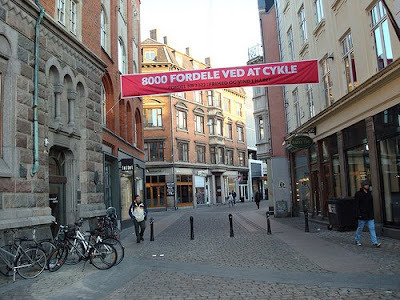 Here's a photo taken from the Dansk Cyklist Forbund's book commemorating their 100th anniversary. It shows a bike lane in the suburbs on Strandvejen, the coast road north of Copenhagen, and the morning rush hour towards the city. The year is 1955. I recognize the location as being Strandvejen 215, if any one is riding past one day. Anyway, separated infrastructure, as we all know, gets people cycling. As the photo clearly demonstrates. It's worth mentioning that this neighbourhood and the ones around it are considered quite posh. This stretch away from the city has been called The Whiskey Belt for a very long time. To distinguish the residents, not always positively in a historical context, from the beer drinking masses. 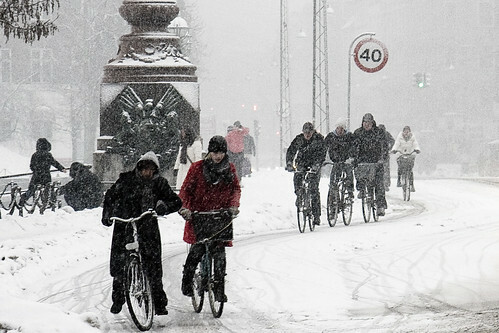 So here are Denmark's middle class to upper class commuting on bicycles to work in the city. 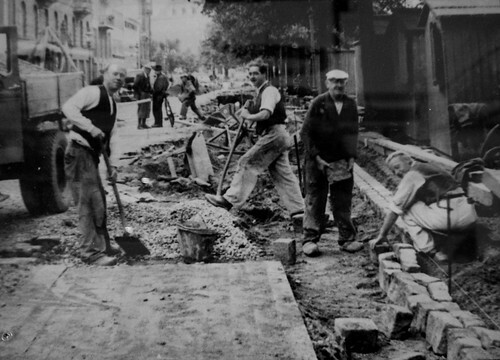 I haven't been able to find photos of the earliest examples of bicycle lanes/infrastructure, but this photo is from the 1920's and show the building of separated lanes. 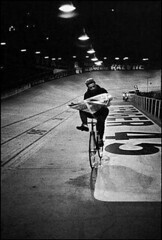 It's from the excellent Copenhagen by Bike exhibition at the City Museum. 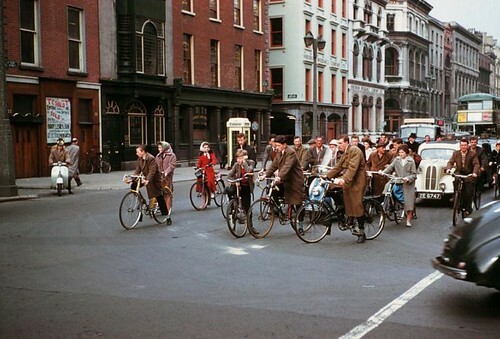 And here's a photo from the exhibition from the beginning of the renaissance of our modern bicycle culture. 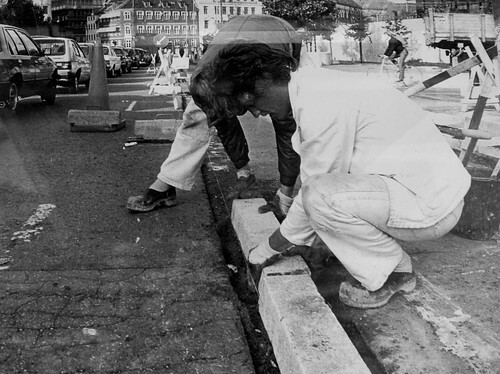 The reestablishment of physically-separated lanes in the 1980's after many had been dismantled due the boom in car culture. Bicycle infrastructure is almost as old as the bicycle itself in countries like Denmark and the Netherlands. A bit younger in the UK, but still old and wise. Winter's grip on Copenhagen is still firm. All the snow is formed into frozen ridges throughout the city. As we've been banging on about, the bike lanes are are a main priority and they are cleared first, long before the roads. The bike lane snowploughs zip dutifully back and forth. I did, however, read that the counties in Denmark are overbudget regarding snow clearing. The annual budget for all the counties is 1 billion kroner [ca. $185 million] and that number is already doubled this year. 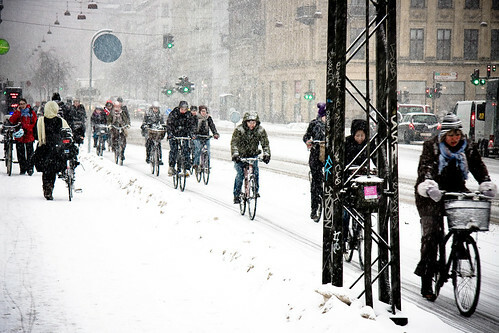 The main thoroughfares in Copenhagen are cleared to accomdate the daily armada of bicycles but on the more minor roads without separated bike infrastructure, the snowploughs ain't been visiting. The roads are divided up into A roads and B roads and the focus is on the A roads with all this snowfall. But I've forgotten about the photo up top. This is near the city centre on a relatively main street. 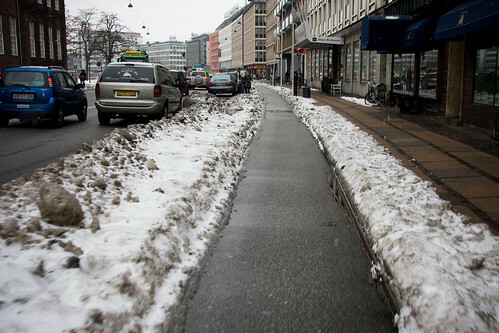 The bike lane is cleared but all the snow from the bike lane and the street has been ploughed into a ridge to the left of the bike lane. Normally, this is car parking. You can see what the minivan has to do to park, sticking halfway out into traffic. Farther along, outside a hotel entrance, cars are precariously parked on packed snow. 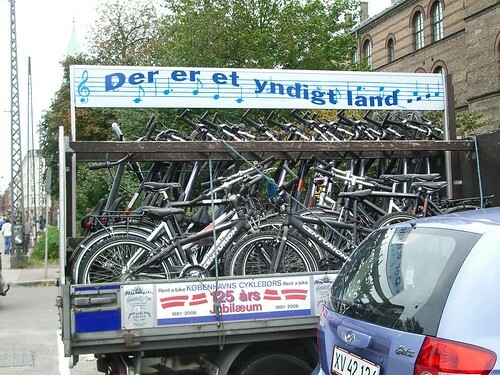 Meanwhile, the bicycles roll on. The vast majority of parents to children at our daycare drop off/pick up their kids on bicycles. Last Friday the children dressed up in costumes to celebrate Fastelavn, the millenia-old Nordic pagan version of the carnival celebrating the approaching spring. 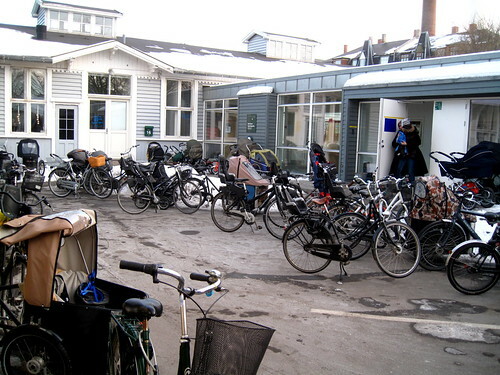 The parents were invited to hang out and have a cup of coffee and a fastelavn pastry, which is why there is congestion in the bicycle parking out front. Normally, the drop off / pick up times are scattered all over the morning / afternoon depending on each family's routine so it was cool to see the armada of bicycles all at once. This is just one angle. I was in a hurry. 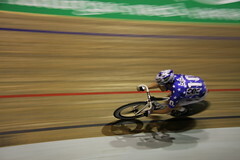 The bicycles continue around the corner and into the beyond. 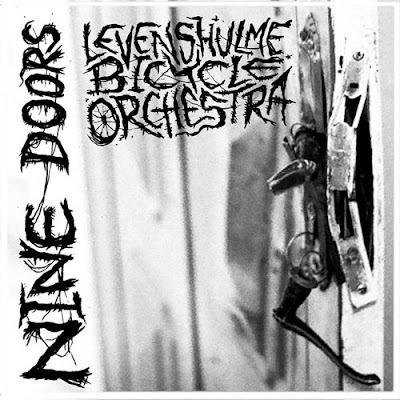 It's different at schools where the bell rings daily at 08:00 so there is an intense flow of bicycles approaching my son's school in the 10-15 minutes up to the bell. Get there early to get a good bike parking spot. This text was seen on posters circulated in London back in 1908. Quite visionary. Time for history to repeat itself? 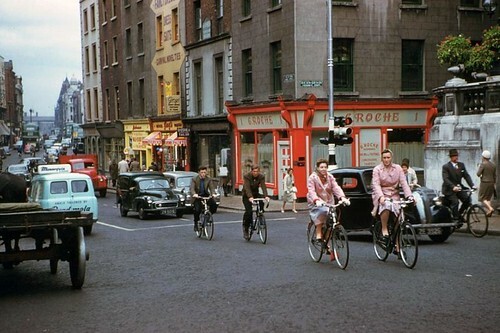 Time to reclaim our streets, not just for cyclists, but for all citizens? As read in the book Death on the Streets - Cars and the mythology of road safety, as mentioned in the previous post. There is a lot of focus in Denmark and elsewhere about using mobile photos whilst driving. It's the cause-du-jour at the moment, it seems. A report from the Technical University of Denmark [DTU] was published yesterday that shows that talking on the mobile occupies a third place on the list of dangerous things to do whilst driving. The researchers estimate that a third of all traffic accidents are caused by lack of attention. According to the report, talking with others in the car is more dangerous and most likely to remove the driver's focus on the traffic. One sixth of the accidents caused by lack of concentration [aren't ALL accidents caused by lack of concentration?] are because the driver had contact with passengers. 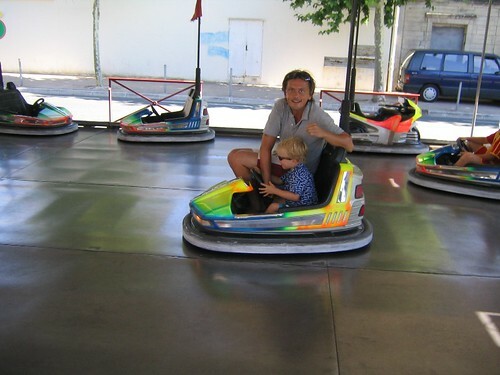 Especially children in the car are a major distraction. Next on the list is adjusting the radio or music system. In third place it's the mobile phone. In fourth it's adjusting the car's climate system and in fifth place it's drivers eating or drinking at the wheel. "What it is that distracts us isn't important. The circumstances are are equal. If you're driving on clear roads in light traffic it's okay to eat a sandwich. On the other hand it can be dangerous to engage in conversation with your passengers or listen to music blasting at high volume if you're driving in heavy traffic." Personally, I would have hoped that their conclusions were the necessity of further investment in public transport and positive campaigns to encourage more citizens to choose the bicycle. I'm realising that such things are increasingly occupying space in my wishful thinking box. 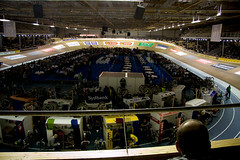 Fine little film about the bikemakers at ANT Bicycles in the States. 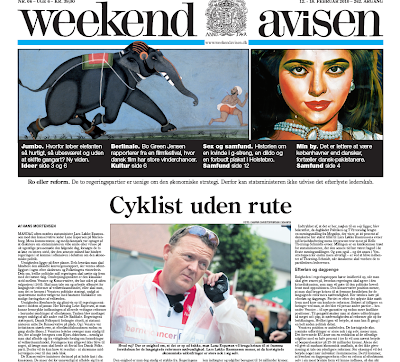 They featured in the awe-inspiringly prestigious Bikes We Like section here on Copenhagenize a couple of years ago. Although we're quite sure that THAT accolade never got them any free beers or knickers thrown into their workshop by screaming fans. Thanks to Matthias for the link.